There’s something about old-style roadside restaurants that just draws me in. Hart’s Turkey Farm in Meredith, NH, is just one of those places. Shortly after moving to NH in 2001, I drove by Hart’s on the way to Weirs Beach, and made a mental note to come back and check it out sometime. Well, it was several years before I found myself in the general area needing dinner, but this last weekend after several hours of rock climbing in Rumney, Carol and I decided to finally visit Hart’s Turkey Farm and check it off the list. We’re glad we did. This place is basically your pre-Interstate style roadside restaurant, focusing on turkey dinners, although they have a full bar and several other entrees. However, one whole page of the menu is dedicated to varieties of turkey, include divan, croquettes, marsala, pies, nuggets, etc… You get the drift. You definitely get the feeling that if you’re here for the first time and don’t order the turkey, you’ve missed the boat. 1. The turkey here is quite well done. A plentiful serving of still-moist white and dark meat (I *hate* dry turkey), served over a nice bed of stuffing, with plentiful gravy. Mashed potatoes and cranberry sauce on the side. We also opted for an appetizer of turkey croquettes, since they looked good at the next table. We agreed. 2. The decor is exactly what you’d expect for a turkey joint. Basically, think “Grandma’s living room”, and that’s what you get. Think dim lights, wood paneling, and lots of turkey plates. 3. Desserts. 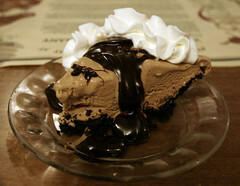 My Mudd Pie was quite the nice finish to the meal. 4. The carrot salad that they give you while waiting to order is quite good. If it was sliced, and not shredded, it would be called “copper penny salad” by Carol’s relatives. In any case, it was a nice way start things off. 5. If you’re looking for a serious food-fest, get the “Complete Meal”, where for an extra $5.99 they round out your turkey meal with the rest of the picture. Salad, appetizer, pie, beverage, etc. We opted not to (we were hungry, but we’re also trying to not eat excessively). All in all, I rather enjoyed Hart’s, and will probably try to stop by again when I’m in the area.